This is really cool. TSTO means "two stage to orbit," but these are not your regular two-stage rockets - they are space planes! The graphic shown here (from robotpig.net!) is based on a 1989 Boeing patent. The launch aircraft would be huge and would use multiple jet engines and a single SSME (space shuttle main engine) to get up to around 100,000 feet and Mach 3.3 where the orbiter would be swung out from below and dropped to continue its flight to orbit. The carrier plane would then head back to the airport to land. Sure seems like the way to go if you want to do it every day and re-use everything, and pretty much all of this technology is off the shelf. 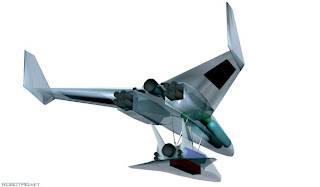 Something like this may already have flown for the US military, but if so, it was top secret (the article shows some graphics on this too, read more in this 2006 AW&ST article). Thanks to Greg Burch for pointing out the robotpig article. The closest thing we have to this in an Orbiter add-on is Kulch's TX winged space launcher. Similar idea, but the TX is able to achieve orbit on its own and carries its payload on its back. Shown here with a standard (for Orbiter) Deltaglider space plane having just separated in orbit. In addition, Greg Burch helped to create an alternate history add-on for Orbiter that has some similarities with the alleged "Blackstar" system. It's an orbit-capable "X-15 Delta" that would launch from atop a Mach 3 XB-70. It's really cool. I have a picture here. P.S. I should have clicked one more link in Greg's post and/or remembered that he has done a number of futuristic Orbiter add-ons as well, including his aptly named BSP4.0 (Big Space Plane 4.0), which certainly resembles the Boeing TSTO design with the orbiter carried under the "booster" (carrier) aircraft. Very cool. Space Expo 2008 at the New England Air Museum today was an excellent event, drawing over 1400 people. There were a lot of cool exhibits, and retired NASA astronaut Brian Duffy gave a great talk on his last mission, STS-92, then signed autographs for a long line of people. We got to set up our tables next to a bunch of classic airplanes including some of my favorite Grumman Iron (F6F Hellcat and F-14 Tomcat). Although his autograph table was next to my table, I didn't get to meet Col. Duffy or show him Orbiter as I had hoped. We were both too busy. I had a long line of kids (and a few adults) waiting to try out Orbiter. While my original plan was to have them try final docking with the ISS, that proved to be too much to explain (thrusters, translation, rotation, closing velocity, joystick buttons, etc.). Instead I reverted to "land the space shuttle from short final." Kids seemed to like that and it only required explaining pitch, roll, HUD symbols, and flaring. The simulated Atlantis took quite a beating. There were a lot of KSC swamp landings (no alligators in Orbiter), a lot of comical bounced landings (the shuttle in Orbiter is remarkably elastic), and a few "greasers." I think at least 50 people tried it and perhaps learned something about space flight in the process. A number of Civil Air Patrol cadets helped out with my table and even gave some of the "flight instruction" so I could take a couple of breaks. I used to be a CAP cadet myself, back in the late sixties. I mentioned this to one cadet who gave me a look suggesting she didn't know they even had airplanes that long ago. Kids and parents were surprised to hear that Orbiter is free and many took my info sheet and said they would download it. I explained that Orbiter was a lot more than shuttle landings, and I pointed to Tex's video "Apollo Remastered" which was running on a big screen, projected from my other PC. This video features the great AMSO Apollo add-on and provides a 10 minute version of Apollo 11 that shows off what is possible with Orbiter. I also ran AMSO scenarios (Apollo 11 launch and moon landing) for a presentation I did in the morning for a pretty good group of people in the museum's large meeting room. My presentation was billed as a Mars landing, but they didn't seem to mind my switching to the moon. At the Ecotarium science museum today, I overheard a discussion between a father and his young son (maybe 4 years old). They had just seen the planetarium show "Cosmic Collisions." Dad: So now we know how the dinosaurs died. Kid: Yeah, that was pretty scary! Dad: Yes, but lucky too - if the dinosaurs hadn't been wiped out, humans might not be here. Kid: But what if a big asteroid is heading for Earth now? Dad: We don't need to worry about that! Kid: But what if one does hit the Earth now? Dad: Well, we have scientists who are working on how to keep that from happening. 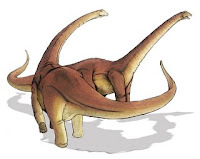 Kid: Then how come they didn't stop the one that killed the dinosaurs? I didn't hear the dad's response, but it's pretty obvious that the dinosaur scientists were asleep at the wheel on that one. Or maybe the dinosaur politicians just didn't see the need for a vigorous space program. The Orbiter table was pretty busy, benefiting from being right across from the ever-popular "try on a real space suit" station. So I got a lot of questions about crashing into Jupiter and the like, but also a lot of real curiosity about space stuff and a surprisingly high recognition rate on the Apollo program from younger kids (they at least knew it was a moon program, and that somebody went). Space Access 2008 is a private space conference that's all about radically cheaper access to space. It's going on right now in Phoenix, Arizona, and several people are blogging from the conference. One of them is Henry Cate of Why Homeschool - you can read his first day impressions here (he also links to the others who are blogging there). Henry started the Carnival of Space which is coming up on its forty-eighth weekly edition. I made some small signs for my table top display at Space Expo 2008 on Sunday. Even though I was running a PowerPoint slide show on a screen and usually helping a visitor trying out Orbiter on the other PC, people who stopped by often weren't sure what I was "selling." Of course Orbiter is free and I was really teaching more than selling - but you still have to get your message out. That's Jupiter peeking out from behind Io, by the way. The Carnival of Space has another new host this week, The Martian Chronicles. It's a very cool blog written by three Cornell University graduate students who do Mars research. Check out the space carney's 47th edition. 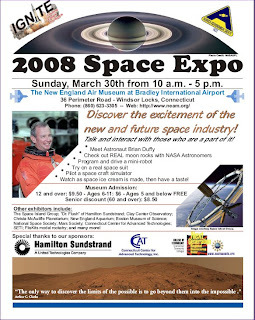 This Sunday I will participate in Space Expo 2008 at the New England Air Museum, located near Bradley International Airport in Connecticut (between Springfield, MA and Hartford, CT). They have a pretty cool lineup with NASA astronaut Brian Duffy, moon rocks, space suits, mini-robots, and a chance to "pilot a space craft simulator." That last part will be me - I will have a PC running Orbiter and visitors will have a few minutes to try final docking with the ISS (or something else if they prefer). I'll have a joystick set up since that makes it look more like a flight simulator even though it's really easier to dock with the numeric keypad thruster controls. I did this last year and it was fun for all, so I'm looking forward to meeting another real astronaut and providing "lead in training" for some potential future astronauts. If you're in the New England area, come check it out. The air museum is cool too, with a lot of classic airplanes on display. When I watched the DVD of "In the Shadow of the Moon" recently, I was reminded again of what a cool guy John Young was (and probably still is). If you look up laconic in the dictionary, John Young's picture will be there. A man of few words, but just amazingly brilliant, talented, and focused. His NASA career was incredibly long (1962-2004). 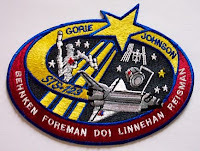 He flew two Gemini missions (3 and 10), two Apollo missions (10 and 16), and two shuttle missions (STS-1 and STS-9). Even at the moments of his two Saturn V liftoffs and when he landed on the moon on Apollo 16, his heart rate never went above 90 (test pilots are all supposed to be calm problem solvers, but most of them experienced 120-150 beats per minute at these high stress times). I pretty much keep politics out of this blog. There are thousands of political blogs for those who wish to read them. But this editorial on the disgraceful treatment of veterans with traumatic brain injuries just really got to me this morning. The fact that more than 4,000 Americans (and many, many more Iraqis) have died in this unnecessary and horribly mismanaged five-year war is bad enough. It has also damaged us in so many ways - economically, politically, internationally, militarily. But the veterans who have been literally and severely damaged by the war deserve so much more help and support than they are getting from our government. We really need to support our troops - by getting them out of this war, and by providing the help that the wounded survivors and their families need and deserve to rebuild their lives. I really don't believe that happy-go-lucky George W. Bush is as clueless and lame a lame duck as he seems to be. But I do believe he is as evil as he seems, and that no matter who wins the White House this fall, it will take years for this country to recover from all that he and his cronies have inflicted on us and on the world since 2001. Air & Space Magazine always has some great articles. I just got the new issue and read an article on the Japanese space program by U.S. astronaut Dan Barry. Barry spent some years in Japan as the NASA contact with the Japanese space agency (then NASDA, now JAXA). This is a timely article since the first section of the Japanese Kibo science lab has just arrived at the ISS on board STS-123. The article is already on line here. I also noticed that the Air & Space web site seems to have an improved design that makes it easier to browse through their extensive archives of articles on space and aviation topics. There is a lot of good stuff out there. I downloaded a great presentation and transcript from a January 2008 briefing for JPL Solar System Ambassadors on the James Webb Space Telescope (JWST). Unfortunately I couldn't attend the live telephone briefing, but I learned a lot from the presentation and the speaker's transcript. It's quite an amazing project, and when it is launched in 2013, it will certainly be a worthy successor to the Hubble Space Telescope. I found an earlier version (May 2007) of this talk by STScI's Knox Long here (~2.6 MB PDF). 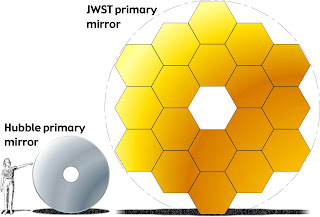 JWST will operate in the infrared and will have a much larger primary mirror than HST, as shown in the graphic above. It will also be vastly more complex. I was talking recently with a colleague who is involved with the validation of the optical fabrication, assembly, and testing plans for JWST. As you might expect, NASA is not taking any chances on a Hubble-type mistake, and there are checks upon checks upon checks, with close attention paid to the assembly and test procedures and the testing optics (which were the source of HST's troubles). But the tolerances are incredibly tight (he mentioned that one engineer cheered when he learned of a particular tolerance that was about the thickness of a sheet of paper - such an unusually huge tolerance would be easy to achieve, but most tolerances are much, much tighter). The number of interacting systems and the number of items in the error budget are simply immense. In addition to the usual problems of precision optical fabrication and the vibrations and stresses of launch, JWST must maintain its precision through a complex automated "unfolding" in space, and must operate at cryogenic temperatures. To stay cool, it will operate at L2, a special orbital point far beyond the moon. So a Hubble-like service mission will be essentially impossible. It will be possible to do various adjustments on-orbit, but it basically has to work "right out of the box" (or launch shroud). When they say this project is challenging, they are not kidding. Will it be ready to launch by 2013? Everybody on the project is working to anticipate all the possible problems so it will make the date and work perfectly - but there is still a long road ahead. I have seen a couple of web articles pointing out that Europe's ATV "Jules Verne" is now in a parking orbit 2000 km ahead of the ISS. This offers the possibility of seeing both spacecraft a short time apart when they pass close enough to your viewing location. I've seen the ISS and shuttle separated on a close pass (STS-118 last summer), and it's a very cool sight. But how to know when and where to look? 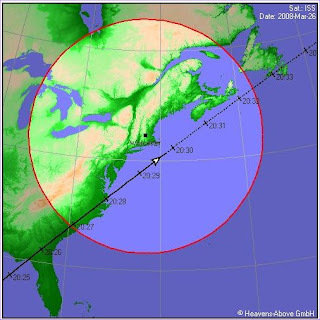 There are several web sites that can tell you when the next visible pass will be for various satellites including the ISS (and shuttle and ATV when they are up). There's a new one from SpaceWeather.com that is especially simple for US and Canadian viewers. With Satellite Flybys, you simply enter your zip or postal code. The results are not too detailed but they give the basic information for the brightest objects - the satellite name, the rise time, the direction to look (like SSW), and the elevation. It seems to exclude low-elevation passes that are near the horizon and hard to see. For more detailed tables, NASA's SkyWatch applet is great. It will also provide a star chart with the object's path if you click the SkyTrack button. The sightings help page includes viewing tips and a nice 3D diagram. Another good one is heavens-above.com which has tables, sky charts, and ground track charts. The latter are useful in understanding why the ISS shows up where it does with the predicted elevation. The example above is for next Wednesday the 26th which should be a decent pass for me if the weather cooperates (max elevation 51 degrees). The circle shows the region where the object is at least 10 degrees above the horizon, and the solid line is where it is lighted by the sun. The dashed area is in the Earth's shadow. P.S. I was driving to Wilton, Connecticut Wednesday evening but skies were clear and I remembered to stop around 8:20 pm. I pulled into a neighborhood with a good view to the south, and I saw Jules Verne sail by, followed a few minutes later by the super-bright ISS. I missed seeing the shuttle because Endeavour had already made its deorbit burn and was about to land at KSC just 10 minutes later (about 8:40 pm EDT). The carnival is back in town, once again hosted by Riding with Rockets. One of the many blog articles included is a brief overview of space elevators at New Frontiers, inspiring me to include this picture, which depicts a space elevator add-on for Orbiter. For some reason this is one of my most popular Orbiter screen shots on Flickr, viewed about 1,100 times (this Earth image is the most popular, 1,890 views). It's also appropriate to show an "Arthur Clarke-style rigid pole space elevator" (as I noted in my Flickr caption), since the great science fiction novelist and space innovator Arthur C. Clarke died this week. His novel The Fountains of Paradise was one of the first to feature space elevators. Several posts in this week's carnival include tributes to this influential author, whose work helped to define many aspects of the space age in our imaginations, even for those who know him only through the great film 2001: A Space Odyssey which he wrote with director Stanley Kubrick. From MIT's Technology Review, an interesting optical design and LED medical invention from UC Berkeley, a low-cost (prototype was $75) microscope attachment for cell phone cameras. The idea is to allow capturing images of blood cells (60x magnification version) and skin lesions (5x version) and sending the images to someone for diagnosis, especially from remote areas. They plan to test it in Uganda, where blood cell images can be used to determine malaria parasite levels. Who knew that a cell phone camera was useful for more than taking goofy pictures of your friends? 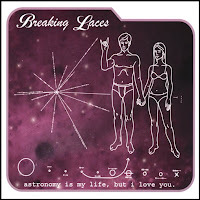 I was browsing through musical ringtones at myxertones.com when I noticed an unusual song title: "astronomy is my life, but i love you" by Breaking Laces. I never heard of this Brooklyn-based band, but I was intrigued, so I located the song on iTunes. It has a tongue-in-cheek, Saganesque cover, and the song is good too. I was trying to check the main Orbiter forum today, and for some reason it was down. Checking the forum list on the Orbiter main web site, I found a link to an Orbiter forum I hadn't noticed before, orbiter-forum.com, so I checked it out. It's really quite good, with a modern and friendly forum interface, and it seems to be quite active. Looking back through the posts, I found it was started in October 2007 by "Tex," an Orbiter user known for his excellent Orbiter videos. Thanks Tex! 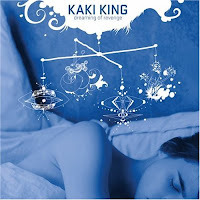 I saw and bought this today on iTunes, "Dreaming of Revenge," a new album by Kaki King. Her acoustic guitar playing is simply jaw-dropping, but this one also has electric, slide, some vocals, and some intricate and very cool arrangements. I also liked her 2003 debut "Everybody Loves You" but this new one is just somehow mesmerizing. On the flight back from France yesterday, I read Jack McDevitt's 1998 SF novel Moonfall. It takes place in 2024, in a generally peaceful and prosperous world that has solved many of today's problems and has developed extensive commercial and government sponsored space programs, including a private fleet of airliner-like SSTO (single stage to orbit) spaceplanes that fly regularly from special underground launch tunnels at various airports around the world and land on long but otherwise normal runways. They carry passengers on fast suborbital flights to distant cities and to space stations in low and geosynchronous orbits. A moon base has also been established (with over 600 people) and is about to be officially opened by the visiting vice president of the United States. A VASIMR-powered interplanetary spacecraft has also been built and is about to depart for the first human mission to Mars. So far, so good. I'm not sure we're on track to have that much stuff going on in space by 2024, but it's plausible and hopeful. But that's just the background for the disasters that are the main thrust of the book. The main suspension of disbelief that is needed for the story is in the detailed setup. While the VP is on the moon to open the moon base, there is also a total solar eclipse, and this allows the detection from Earth of a previously undetected sun-grazing comet (hard to see without a convenient eclipse). The comet is huge and unbelievably fast (apparently coming from outside the solar system), and it is just five days away from a direct hit on the moon. There is no way to stop it, and the moon will be destroyed. There are problems with evacuating the moon base and with predicting what will happen to the debris from the moon's destruction - will any of the fragments hit the Earth? You bet! There are many characters and subplots that show us the kinds of problems this event could cause. The characters and situations are generally believable, as are the effects of the bombardment of the Earth, and most of the technology. The moon and the Earth have both been hit by many huge objects over our ~4 billion year history, and we could be hit again any time. There could be sun-grazing objects coming from the Oort cloud or from some exploded star, and it's possible that one of these could hit the moon or the Earth with disastrous consequences. The eclipse, the five-day warning, and the Veep on the moon are obviously contrived to set up a complex disaster novel. But stranger things have happened, and it mostly worked for me. Smaller objects hitting the moon or the Earth are more likely, and I think we ought to be preparing for this, as advocated by the B612 Foundation. This was the first McDevitt book I've read, and I liked it. Setting up the various characters and situations was sometimes slow, but it all paid off in the second half of the book. It certainly held my interest and made me want to check out some of McDevitt's other books. The loss of the moon would have some serious long-term consequences for the Earth (changes in the Earth's rotation, tides, and axial tilt stability, among others). The scientists in this book discuss some of them, though the story focuses more on the short-term "fallout" and the plucky resourcefulness of the characters. You can learn more here, here, and somewhat humorously here. There is also a 1993 book, What If the Moon Didn't Exist?, which seems to be out of print. 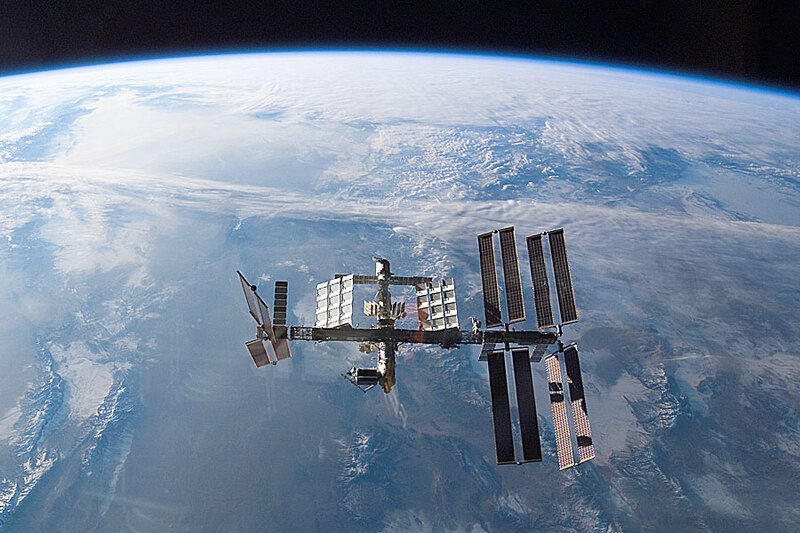 Of course the ISS is the "international" space station, and at this moment, the shuttle Endeavour is docked there to deliver and install a Japanese science module and a Canadian robot arm, adding to the ISS components already in place from Russia, Europe, Canada, and the United States. ISS and current shuttle crews are Russian, French, Japanese, and American. I believe that the extensive and peaceful cooperation among the participating nations is one of the greatest things about the ISS. You could call this "orbiting for peace." There's another international space program, one that takes place in cyberspace and centers on Martin Schweiger's freeware Orbiter space flight simulator. It includes "orbinauts" from all over the world, many of whom regularly participate in the Orbiter Forum. Some 612 have registered their locations with Dansteph's Orbinauts World Map (statistics here). Forum users help one another with Orbiter problems, collaborate on add-on development projects, post screen shots and videos, discuss real space developments, and more. 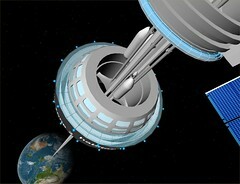 Many orbinauts also have web sites that help support other Orbiter users. Orbiter itself is not a multi-user program (though there have been some multi-user add-on projects), but the shared interests of these space flight simulation fans have created a real community. One small example is the recently released Mars for Less add-on project. The developers included two guys from the UK (one of whom was living in Finland for most of the project), one Canadian, and one American (me). We also got a big assist from a guy from Portugal. Other Orbiter add-on projects are even more international in scope. One of the essays in the book What Are You Optimistic About? is "How Technology Is Saving the World" by Diane F. Halpern. She writes, "The strangeness of 'foreigners,' which used to define the relationship between people of different religions, customs, races, and regions of the world, is disappearing as the rapidly increasing numbers of users of technology connect over time and space in ways available only to members of the same clan or village a few decades ago." The Orbiter community is a good example of this sort of specialized "global village" and I like to think it contributes just a bit to world peace. It may be a virtual village of people playing in virtual space, but in a way, we're orbiting for peace too. Isn't it funny how middle age just creeps up on you? The 45th Carnival of Space has been posted at Observations from Missy's Window, and I just can't believe the Space Carnival is 45 already (OK, it's weeks, so not exactly middle age). There are excellent posts from many of the usual space and astronomy blogging suspects as well as posts from a few fresh faces (new to me anyway). Check it out. Maybe I'm relying too much on TED videos, but they sure have a lot of interesting people and subjects, and besides that, I don't have much time to think and write in the middle of this very busy trip (and French dinners take a long time). This brief TED video is about Project Orion, the late-fifties/early-sixties plan to build giant rocket ships propelled by energetic "pulses" created by exploding a sequence of many nuclear bombs behind the ship (giant pusher plates and shock absorbers would try to make this tolerable to the crew). The speaker is George Dyson, a historian whose father, Freeman Dyson, was involved with the Orion Project. George has a lot of documents and images on this project that he probably shouldn't have. Wild stuff. What's that you say? You'd like to see what flying this Orion nuclear pulse propulsion spacecraft would have been like? You won't be surprised to learn that there is an Orbiter add-on for this project, created by "Sputnik." Be careful with time acceleration if you have any issues with rapidly flashing lights. The wonders of the internet and of international time zones just allowed me to watch the nighttime liftoff of Endeavour on its STS-123 mission to the ISS. It was about 2:28 am in Florida but a friendlier 7:28 am here in Paris where I had just gotten out of my shower. My RealPlayer video feed was decidedly low-res but OK, though I couldn't capture a screen shot from the video overlay. So here is the mission patch which depicts the delivery of the first section of Japanese Kibo science module which is the main task for this mission. I just watched the external tank separation so Endeavour has made it to orbit. A great launch! Steve Jurvetson has a cool hobby that he discussed and showed recently at TED. He also takes a lot of cool pictures. 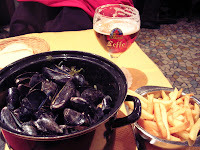 I'm in Paris, and it's raining and chilly, but I've completed my first customer visit (just hours after arriving) without falling asleep, and I've had a nice meal of "moules et frites" (mussels and fries) at Léon de Bruxelles. I've been reading the essays in What Are You Optimistic About? and many of them are quite thought provoking and even inspiring. I will have more to say on this in days to come, but confining myself to just the short run, what am I optimistic about tonight? I am optimistic that my suitcase has finally been loaded on a United 777 in Washington Dulles and will arrive at Paris CDG tomorrow morning. I am optimistic that said suitcase will be delivered to my hotel between 10 and noon tomorrow as more or less promised. I am optimistic that I will be able to continue to wear my one pair of pants by not spilling red wine on them, even if this means switching to beer (it's working so far). I am optimistic that before my suitcase actually arrives, I will not need more than the one additional clean shirt and very few other essential clothing items that remain. Admittedly this is aiming low and I am actually optimistic about other things too. But on 3 hours of sleep and after two beers, this is the best I can do. 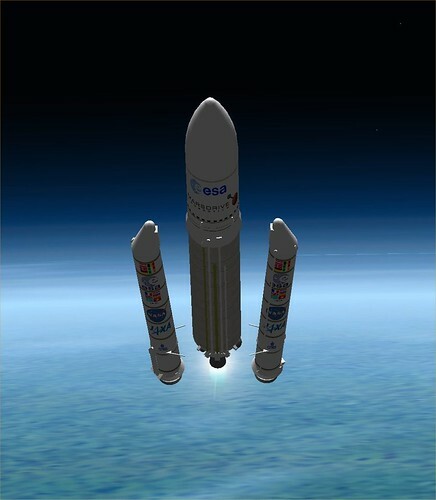 Although my personal "launch" to Paris was aborted by the nasty weather in the Northeast yesterday (I'll try again today), the launch of the ESA "Jules Verne" ATV cargo spacecraft was successful. It launched on an Ariane 5 spacecraft from the Kourou launch site in South America. I have launched a number of virtual Ariane 5's in Orbiter since this is the launch vehicle we use in the Mars for Less project to place the components of the Mars ships into Earth orbit as shown here. The ATV will have to "loiter" in orbit for a while, performing various tests before docking with the ISS on April 3. In the meantime, the shuttle mission STS-123 (planned for launch on Tuesday) will have come and gone. The traffic up there is getting to be brutal. I've got two new "serendipity" books for my trip next week, both discovered in a quick bookstore stop. What Are You Optimistic About? really looks great, judging from the few brief essays I've read so far. They asked the title question of a lot of interesting people, and they got a lot of interesting answers. Several people write about prospects for solar energy, and one writes about how by some measures, violence in the world is actually decreasing (if this is true, you would never guess it from our news sources). It's cool to see some experts looking on the bright side, and explaining why. That's a nice half-full glass on the cover, by the way. The other book is SF, just something that looked good in the bookstore, by an author I never read, Jack McDevitt. The book is Moonfall, and it involves a comet hitting the moon in the near future. Reviews are generally good so we shall see. The April 2008 issue of Discover Magazine just arrived. There's an article called "Space Treks" ("seven ways to be a space tourist even if you're broke"), and it covers zero-G flight (which the reporter tried, $3500) and a range of pricier and some not-quite-yet available options (suborbital for $200K, ISS orbital for $30 million, moon orbit for $100 million). The usual space fan's dreams. Absent the money or time for any of the above, or if your ambitions go beyond the moon, there's only one option: going virtual. 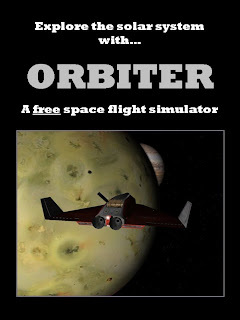 If you have a PC and an Internet connection, you can download - for free - the Orbiter spaceflight simulator, developed by Martin Schweiger, a physicist at University College London. 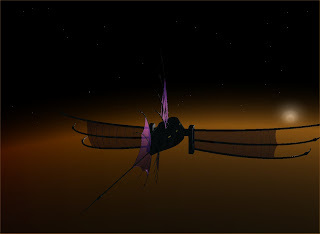 Orbiter lets users pilot historical and fictional spacecraft around the solar system; options include flying a shuttle resupply mission to the space station and guiding a glider through the hazy skies of Venus. That's all true, and with free add-ons, the range of things you can fly in Orbiter is quite amazing. 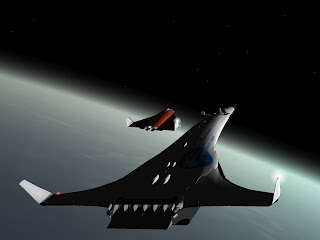 The picture here shows the aforementioned Venusian skies with a fictional "space yacht" inspired by album art from the band Yes (more Yessongs pix and add-on info here). And to get started with the less exotic space station, moon, and Mars missions, you can also download my free Orbiter tutorial e-book Go Play In Space. Check out Carnival of Space #44 over at Phil Plait's always informative and entertaining Bad Astronomy Blog. This week Phil has managed to fit (or force) everything into a Mars theme to create the Angry Red Planet Edition. 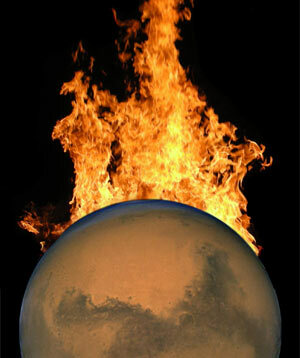 Note that this picture does not imply that Phil believes the Face on Mars is now burning. I got a press release from JPL saying that Cassini has recently detected evidence that Saturn's moon Rhea may itself have rings. That would be a first for a moon in our solar system. Pretty funky. While at the JPL-Cassini site, I noticed a video about Cassini's upcoming March 12 flyby of another moon, Enceladus. This one really shows the confidence they have in the orbital mechanics and guidance systems with this veteran spacecraft. They will pass within 50 kilometers of the surface. 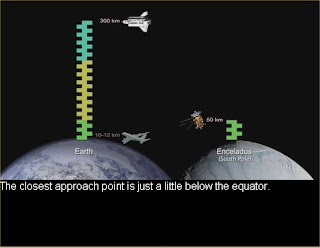 That's a pretty close shave (the video frame here compares this to the shuttle's typical Earth orbit altitude of 300 km). Its goal: "To scoop up samples of water-ice particles and gas spewing from Old-Faithful-like geysers." The QuickTime movie is here (I don't know how to embed the JPL videos). I once wrote a macro program to calculate days between dates. This is a common sort of routine that wasn't really needed in my application, but for a sort joking encouragement to myself to work harder (it ran every time the program started). I called it MOZART and when it ran, it compared the day's date to my birthday, reported the difference in days and years, and told me that when Mozart was my age, he had been dead for 11 years (or whatever). I hadn't looked at this macro in years, but I ran it the other day and noticed that today would be somewhat special. Yes, today I am 20,000 days old. I have experienced 20,000 spins of the Earth (and well over 54 trips around the sun). Whoopee! If you want to find similar fascinating facts for yourself, you can try this or many other date calculation sites. I wrote about Pleo about a year ago when I read about its development in Wired. It's available now, and the Reuters video here gives a pretty good overview. The reviews at Amazon are generally very positive. Some people are really bonding with these little $304 robo-dinos, complaining mostly about short battery life. It's a very interesting product. And it doesn't run Windows, it runs LifeOS. Speaking of bonding with robots, the Roomba I bought in December has become our dog's best friend. Jackie is odd anyway because he loves vacuum cleaners - get one out and he gets excited and runs to get a tennis ball, because vacuum time is ball chasing time around here. Now during the day, he has Roomba to play with. We turn him (oops, it) on when we leave for work and Jackie follows it around and drops the ball in front of it. Roomba docks itself when its battery runs low, and sometimes Jackie even gets a second Roomba play session at lunch time. He loves that little robot - we can't even say "Roomba" in Jack's presence or he gets very excited. So I'm having dinner at a T.G.I. Friday's with my daughter, and they have all sorts of pop culture paraphernalia on the walls - photos, album covers, models, whatever. 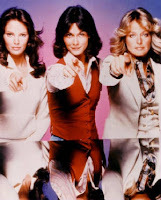 Above our table is this photo of TV's original Charlie's Angels from the 1970's, and I point out to my daughter that the one in the middle was my favorite, Kate... Kate... Kate what? All I can remember besides "Kate" is Farah Fawcett and that the first name of the angel on the left started with J. So out comes the Blackberry, I browse to Google, type in charlie angel kate, and in seconds, I can "remember" Kate Jackson and Jaclyn Smith. Although remembering television actors from the 70's is perhaps not the best measure of mental acuity, it's just one of many examples. I'm lucky to now have a brain prosthetic I can use almost anywhere. I can't wait for the implant version. Lots of preparations this week for a business trip on Saturday. Lots of stuff to learn so I can give demos of many new software features to some French customers next week. So too busy to read much or blog, but I did notice today's APOD which is a wonderful view of the International Space Station from shuttle Atlantis on the recent STS-122 mission to install the European Columbus lab module. I just set this one as my computer wallpaper. 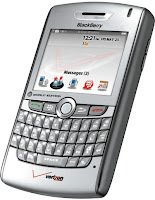 Since I now have wireless internet access on a truly mobile device (new Blackberry), I took a quick look to see if there are any astronomy applications for it, and I found MicroSky (v3). It's pretty cool, and it's free. Essentially it's a small Java application which can run on many mobile devices, as long as they can access the internet to get the sky data from SkyServer. 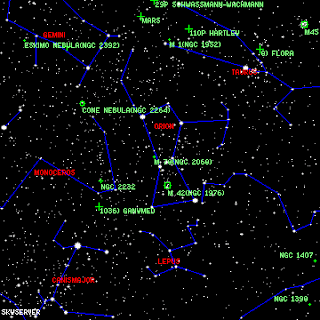 SkyServer is a free astronomical database service that you can also use on a regular web connection. MicroSky is tailored to the small displays and limited computing and control capabilities of mobile devices. You need to set up a free account on SkyServer to use MicroSky. You log into it on your mobile device to get the pictures you want sent to your screen. So how is it? Well, compared to Stellarium, it's more of a star chart than a planetarium, but it's a dynamic little star chart you can hold in one hand anywhere you have a cell phone signal (like the middle of some big, dark field). It's got features for defining where you are and what you want to see. It even has orientation aids on the screen - point your phone south and two circular "altitude/azimuth" icons help you to line up your display with the part of the sky it is displaying. Simple and clever, and explained with pictures in the small manual (the screen shot above doesn't include these, but see below). It has GPS and BlueTooth support too, but I haven't gotten that far with the Blackberry yet! If you would like to see how this works before downloading and installing the (tiny) files, there is a working demo of MicroSky v2 here. You click the buttons of the on-screen phone as if you were pressing them on a real device (except you get to use your keyboard to type the login info). You can use the demo account, but it's better to create a free account so you can set your own location. This will also show you the altitude/azimuth icons. Testing ability to blog by email from this silly new little Crackberry I said I could never get addicted to. I can sorta see the problem now. I've been reading about Microsoft's upcoming WorldWide Telescope for a few weeks on various blogs, but I wanted to wait to talk about it until more information was made available at last week's TED conference in Aspen. Fortunately they have released this video of the 7 minute TED presentation much more quickly than they usually do with TED talks. There's a high-def version of this video that you can download here. WorldWide Telescope will be available this spring as a free download (but I believe it will only run on Windows machines). WWT will be similar to the "sky" extensions for Google Earth, but whereas Google Earth in sky mode looks and feels kludgey to me, Microsoft's new effort is described as "seamless" and "elegant" in the way it stitches together astronomical imagery from the web and allows you to explore and to experience it and create "tours." It looks to me very much like the interface of the free program Stellarium that I often use for demos, but cleverly linked to a huge online database of imagery. I'm looking forward to trying out WorldWide Telescope when Microsoft releases it. Based on the rave reviews of a lot of knowledgeable people, I'm sure it's good, and I hope it's great. Women can do anything. That's what I've always told my daughters, and it's what I like to tell Girl Scouts and other girls I meet during educational outreach activities. The good news is that it's true, at least in many parts of the world, and there are many inspiring examples. The bad news is that some of the most visible role models for women are pretty negative - people like Britney Spears, Paris Hilton, etc. who are famous for being famous (or something - of course there are also many celebrity women who are known for their talents and good works). Fortunately there are also positive role models in the growing numbers of women in business, government, law, medicine, sports, etc. as well as in more traditional roles such as teaching. Of course there is still room for improvement, but with a woman making a serious run for President, it's clear we have made a lot of progress. But in some fields such as science and engineering, there are still relatively few role models for women. You could point to woman astronauts like Eileen Collins and Peggy Whitson, but there are very few astronaut jobs for men or women. There are many women in non-astronaut space and astronomy roles, as Emily Lakdawalla pointed out in her recent Planetary Society post about an all-female team of Mars Rover scientists, engineers, planners, and operators. Women are doing all these things and more in science and engineering, but how can girls find out about these possibilities? There's a new series of books and a web site from the National Academy of Sciences, iwaswondering.org, that addresses this issue. 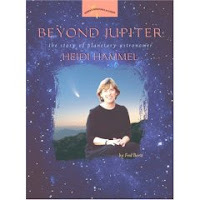 The book series is Women's Adventures in Science, and I just bought and read one of them, Beyond Jupiter: The Story of Planetary Astronomer Heidi Hammel by Fred Bortz. Dr. Hammel has specialized mainly in the outer planets, especially Uranus and Neptune, though she also was the team leader for Hubble observations of Jupiter for the "Great Comet Crash" in 1994. The nice thing about this book is that it is not only about her science accomplishments, but it also talks about Heidi Hammel as a regular person. She was a smart girl who didn't really know what she wanted to do, was encouraged to apply to MIT, got accepted, struggled with physics classes there, got interested in astronomy, and went on to get a Ph.D. in astronomy. She has done breakthrough work and has received many awards. But she has also been a musician and a Grateful Dead fan and later a wife and mother of three children. The book includes quite a bit of information on planetary astronomy to help explain the work she has done. This is a really good book, and I strongly recommend it to parents or teachers to share with their daughters and students.